Thanks to Jen H and WordPress for the Weekly Photo Challenge Details. How many different types of feathers do you see in this detailed image? 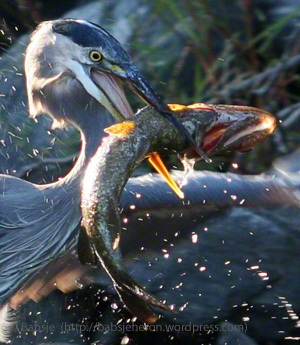 From July 1 through July 30, 2016, my Great Blue Heron photographs once again grace the walls of the lobby and theater in a free one-woman show at the Summer Street Gallery, of The Center for Arts in Natick. TCAN has a lively, dynamic lineup of upcoming performing artists. Posted on July 20, 2016, in ardea herodias, Art, Birds, daily prompt, Great Blue Heron, Kayaking, Photography, postaday, Weekly Photo Challenge, Wild Bird Wednesday, Wildlife Photography, Wordless Wednesday and tagged great blue heron, postaday, TCAN. Bookmark the permalink. 8 Comments. Love the lines, designs and colors of your close-up, Babsje. Good luck on your exhibition.